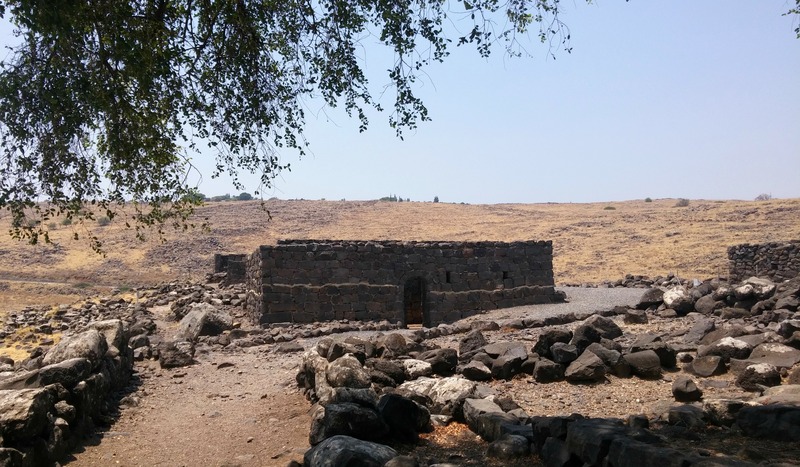 About a month ago or so I visited the ancient city of Korazim, located just north of the Kinneret (or Sea of Galilee). 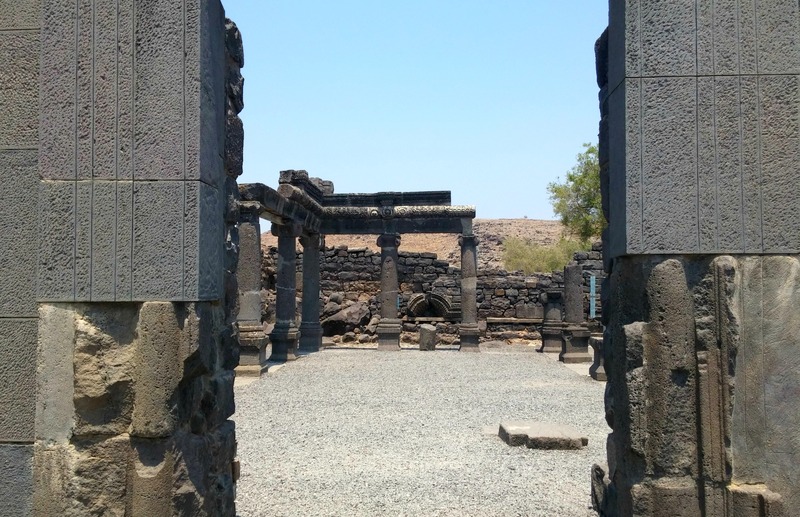 It was a scorching day yet we persevered and toured the black basalt ruins, taking shelter under the scattered trees as we passed from site to site. We started on the paved trail passing the ruins of houses and then the ancient mikva (ritual bath) on the right-hand side with more ruined houses on the left. Shortly we reached the central attraction of the park, the ancient synagogue. Korazim was founded in the 1st or 2nd century CE, around the time that most Galilean synagogues are dated (following the destruction of the Second Temple by Titus and his Roman legions). Jewish sources note Korazim as a place with good wheat while Christian sources mention the city as cursed, destined to be destroyed – which it was by an earthquake. Most of Korazim’s ruins date to the 3rd and 4th centuries CE and the town was slowly restored in the following centuries. Settlement was resumed towards the end of the Crusader period, although on a much smaller scale. 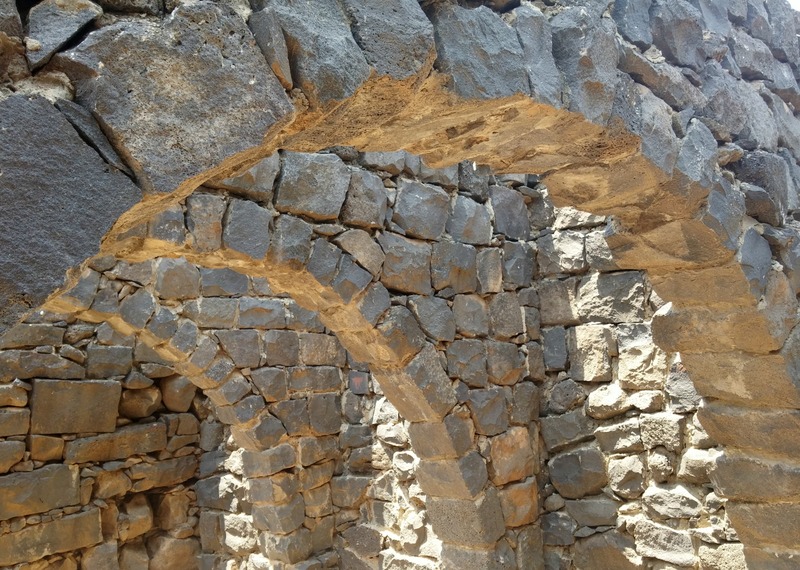 Archaeological excavations of Korazim began in 1905 and were taken up again intermittently throughout the century, the last taking place in 1983 before the park was opened to the public. I had a university class about the late Roman and Byzantine eras and ancient synagogues were discussed. 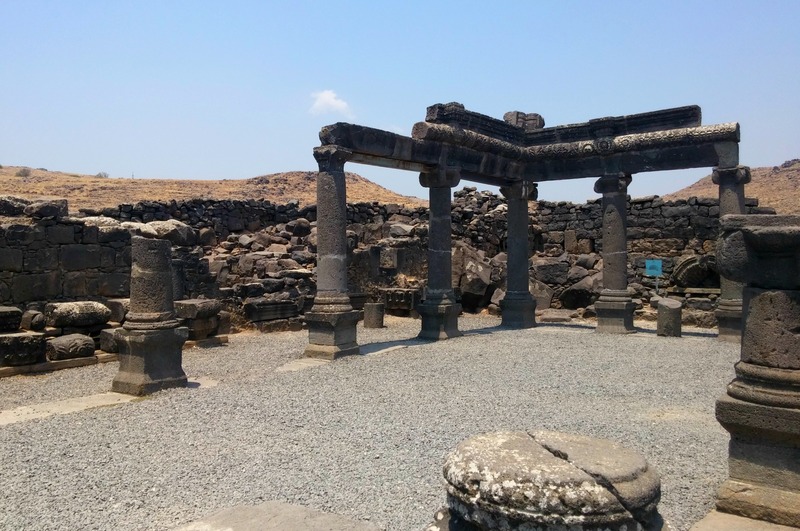 I learned the identifying characteristics of a Galilean synagogue and was pleased to be able to point them out as I explored Korazim’s ancient house of prayer. 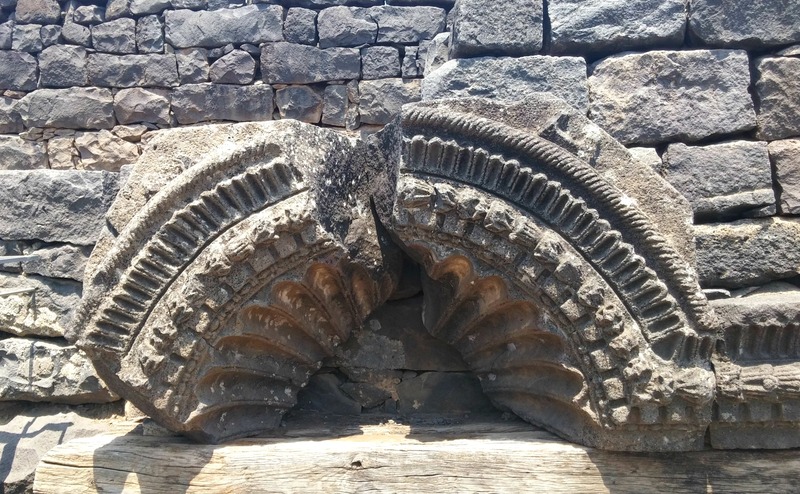 Some interesting features were the carved ornamentations in the building’s interior, the large basalt columns and a replica of the “Seat of Moses”, the original being held in the Israel Museum. Leaving the ancient synagogue we took a short break under a nearby tree, refreshing ourselves with a water bottle. As we sat on a stone wall, nature resumed around us. Agamas scrambled around on the tree branches and various small songbirds flitted about; warblers and graceful prinias. In the skies beyond the tree’s foliage I identified a little swift for the first time, and then shortly thereafter what looked to be a flycatcher of sorts flying low over the basalt ruins. Excited with my birding finds we continued along the path to the western quarter of the city, to the ancient oil press. Korazim might have been known for its wheat production but all ancient Galilean cities partook in the production of olive oil as well. 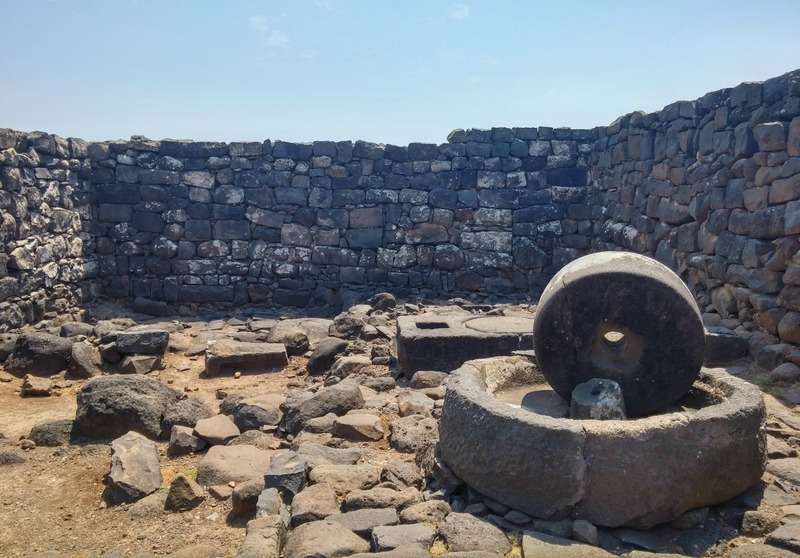 This particular oil press is built of basalt, as is the rest of the city. A relatively small national park, we then headed past the southern quarter of houses and looped around the central quarter of housing with a paved courtyard. From there it was the path back to the parking lot. Driving out, we saw the scant ruins of more Korazim houses on the hillside opposite the road – the northern quarter. Continuing on Road 8277 we then reached the Kinneret and turned onto Road 87 passing Capernaum before turning onto Road 90 – Israel’s longest road. Our next destination was the Yigal Alon Centre in Kibbutz Ginosar. Inside the Yigal Alon Centre is the house of the Man in the Galilee museum and the Ancient Galilee Boat, also known as the Jesus Boat. 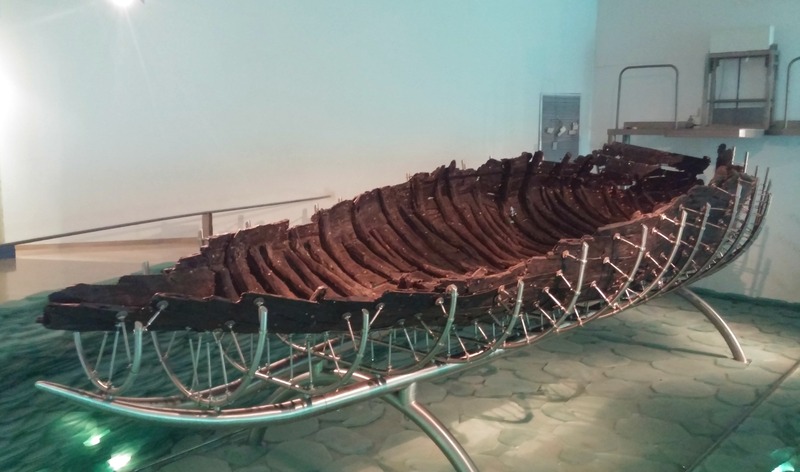 We gained entrance and began by looking at the preserved 2,000-year-old fishing boat on display. 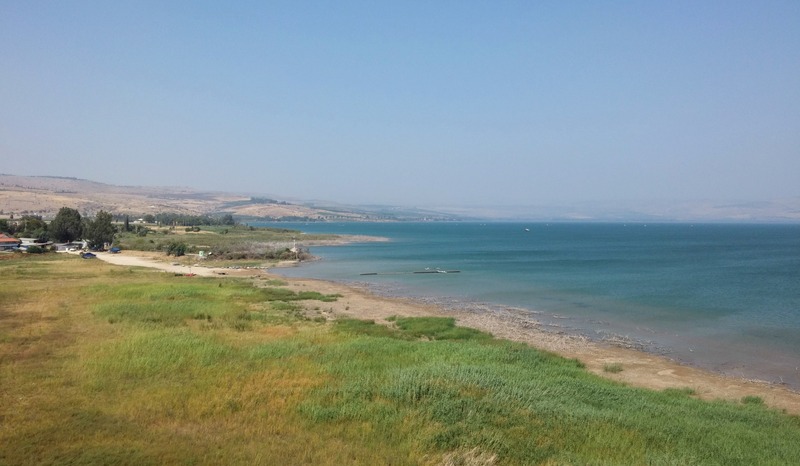 In 1986 the Kinneret suffered a drought and the waterline receded, allowing the wooden boat to be found buried in the mud. A great restoration process was undertaken and the boat was chemically treated to extend its longevity, then presented to the public years later. One of the things I found most interesting about this fishing boat with unknown origins was the breakdown of woods used in its construction. The bulk of it was made of Tabor oak and cedar with the addition of these following woods, to mention a few: carob, Aleppo pine, sycamore, willow and Atlantic terebinth. From the darkened room that holds the boat we then explored the Man in the Galilee museum. 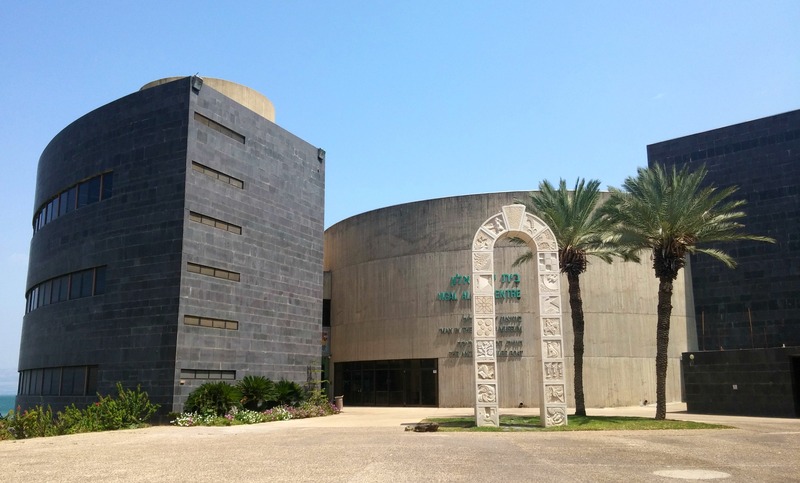 With just a few actual antiques on display I found the museum to be underwhelming but enjoyed riding up the Nechushtan-Schindler elevator and seeing the view of the Kinneret from the centre’s roof. Wrapping up at the museum we ended the day of adventures, ticking these two sites off my to-see list. I may have said this before, but I’ll say it again – I love your photos and write-ups. Keep them coming. Thank you Mark, it means a lot to get great feedback! This is one of my favorite places in Israel. I can visualize walking to korazim from Tiberius. Very interesting description of your mini-adventure w/wonderful pictures. Thank you. Thank you Jane, I’m glad you enjoyed!